GitHub - etraxis/etraxis-obsolete: Obsolete legacy version of eTraxis. Obsolete legacy version of eTraxis. Want to be notified of new releases in etraxis/etraxis-obsolete? 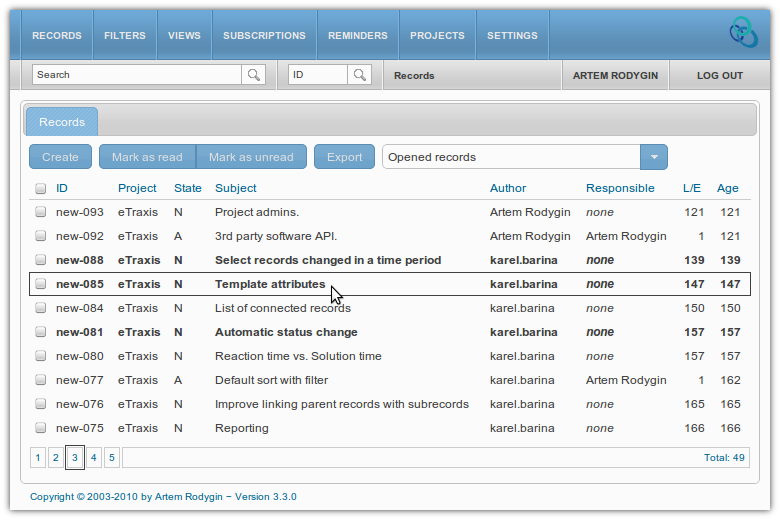 eTraxis is an issues tracking system with ability to set up unlimited number of fully customizable workflows. eTraxis can be used for tracking almost anything, but the most popular cases are bugs tracker and helpdesk system. You can sign up and try eTraxis online at https://www.etraxis.com. Project documentation can be found at wiki pages. If you found a bug, or would like to request a new feature, please feel free to submit it in the project's tracker. Also there is a "Support Forum" available.